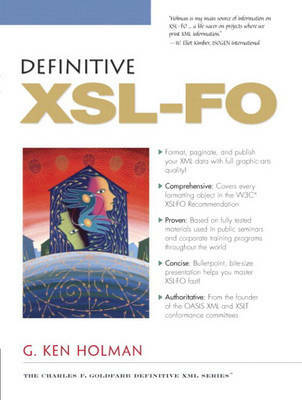 Definitive XSL-FO delivers concise, authoritative coverage of every key facet of the new W3C recommendation, XSL-FO. XSL-FO (XSL Formatting Objects) is the critical enabling technology that allows enterprise applications to produce production-quality output from large XML data stores. There is a large constituency of users of information who prefer the printed format of physical pages over the screen format of a web document. As more web services are deployed and more companies bring more of their information into XML structures, the need for the printed form will grow. Developers have long been used to producing HTML reports and screen-based results, without considering paginating their information into a form (such as a PDF file) suitable for printing.